Will you become a millionaire? What will be your life like in 2015? Will your love life be happy? Will you travel abroad next year? What will your day be like? How will your health be next month? Will you face any issues with family or friends? Find instant answers to your questions totally free with genuine Tarot Card Reading. Know your future with Tarot Cards. Simply think of a question in one of the following areas of your life and get it answered instantly with Tarot cards. 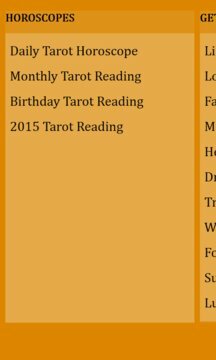 Readings available include 1 card, 3 cards, 4 cards and 5 cards. - Will Your Wish Will Fe Fulfilled Or Not? Use the app to get answers to questions you face in your daily life. 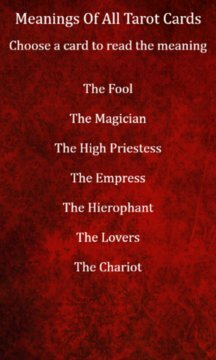 It uses all 74 Tarot cards including 22 Major Arcana and 52 Minor Arcana, based on the Rider-Waite deck. There is an option to shuffle the cards if you wish.